in 2016, following an RCN campaign. The RCN is playing catch-up in England. While the other three UK countries have – at the least – the semblance of a national approach to safe staffing, the NHS England hierarchy continues to look relatively unresponsive. 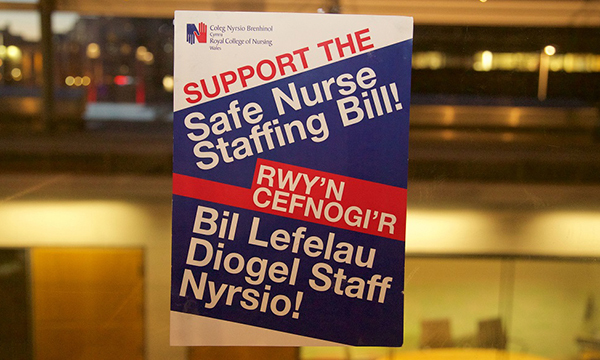 The RCN intends to advocate for ‘legislation’ on staffing in England. It is not yet clear what this will mean in practice or how likely it is to make any progress at Westminster, which rarely looks beyond its own bubble these Brexit-conflicted days. As I highlighted in my column in November last year, there are already working examples of legislation in progress in Scotland and Wales. This is based on mandatory use of staffing tools and a legal requirement for management to respond to local staffing problems. Health and social care secretary Matt Hancock also hinted late last year that he might examine the possibility of introducing safe nurse staffing legislation in NHS England, but this may just have been end-of-year musing. Meanwhile, other countries continue with alternate legislative approaches. The Australian Nursing and Midwifery Federation – a long-time advocate of legislated staffing ratios – is currently advocating to extend these ratios from hospitals to aged care. A Royal Commission examining aged care in Australia has heard troubling evidence on the impact of poor staffing levels on the quality of care in aged care facilities. Having first helped expose the tax avoidance techniques used by some of the major private sector (but publicly subsidised) aged care companies in Australia, the federation is now pushing for mandatory ratios in the sector. The counterargument to the staffing certainties of using legislative ratios is that they can create local inflexibilities, reducing the ability of local management to respond in the way it thinks best on nurse staffing levels and mix. With 40,000 nursing vacancies and repeated media coverage of NHS trusts struggling to maintain staffing, this argument currently has a hollow ring in England.